Hello everyone. 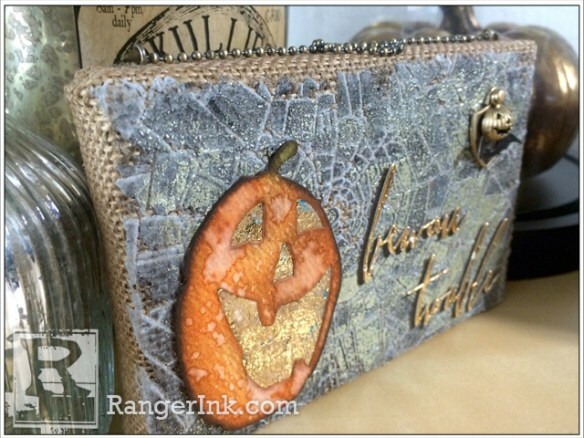 I’m excited to be here at the Ranger Blog with a tutorial for a simple Halloween themed burlap panel with a glassless faux mercury glass technique using Vintage Shiny Transfer Foil Sheets and a burlap panel. Step 1: Take an ideology 4×6 inch burlap panel. 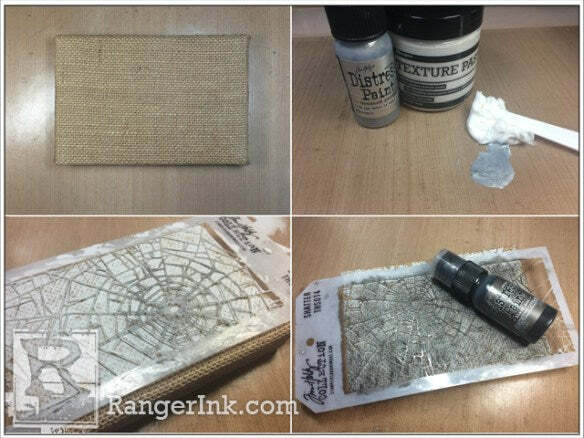 Mix a little Brushed Pewter Distress Paint and Texture Paste on a Non-Stick Craft Sheet. Spread the paste through a stencil with a palette knife and set aside to air dry. 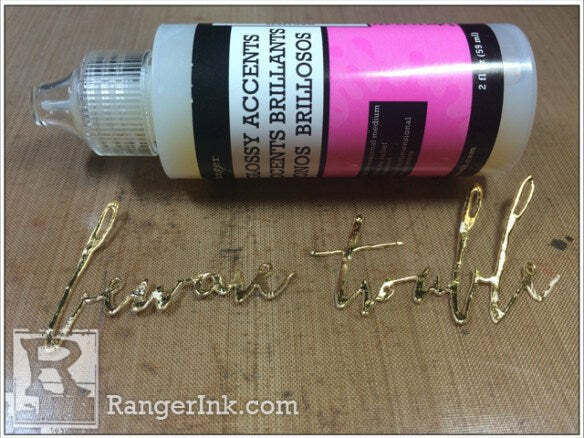 Once completely dry, place the stencil back over the Texture Paste and lightly swipe with Black Soot Distress Paint and set aside to dry. Step 2: Dab Matte Multi Medium over parts of the dried Texture Paste. 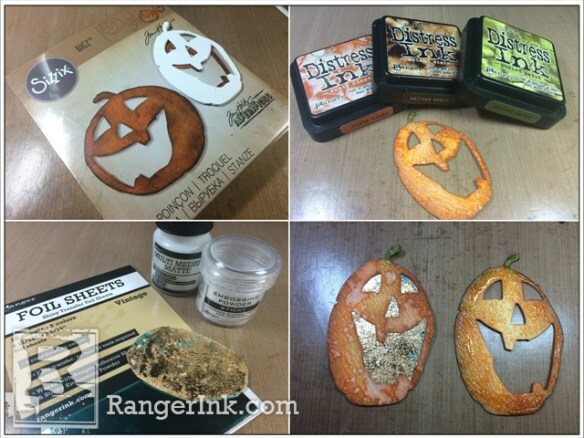 Cover with Sticky Embossing Powder, shake off the excess and melt with a Heat Tool. Be careful not to overheat the powder as it will lose its stickiness. 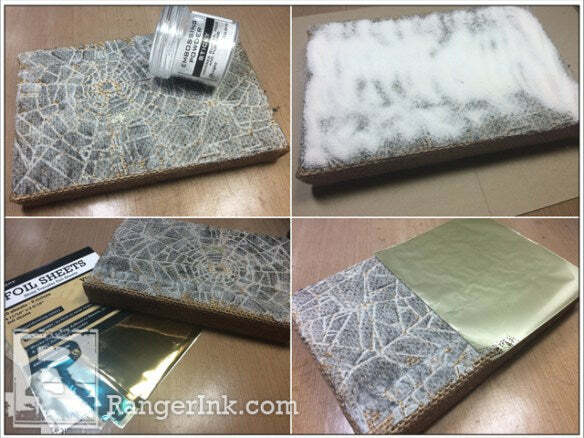 Allow the melted powder to cool completely, then take a sheet of the Vintage Foil and cover part of the burlap panel. Burnish down with your finger and then pull up the sheet. Repeat over other parts of the canvas using all the foil on the sheet. Step 3: To decorate the panel, die cut 2 of the the smaller jack-o-lanterns from Watercolor Cardstock and colour with Rusty Hinge Distress Ink using a Mini Ink Blending Tool with foam. Colour the stork with Peeled Paint Distress Ink and edge with Walnut Stain Distress Ink. Spritz with water and set aside to dry. Cut a manila tag to sit behind the jack-o-lantern’s face. 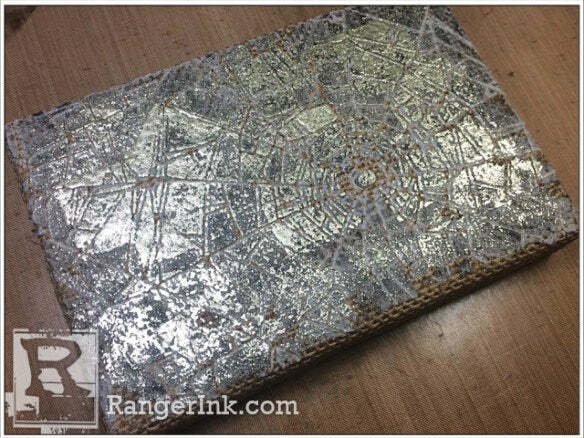 Cover with Matte Multi Medium, sprinkle over Sticky Embossing Powder and melt. 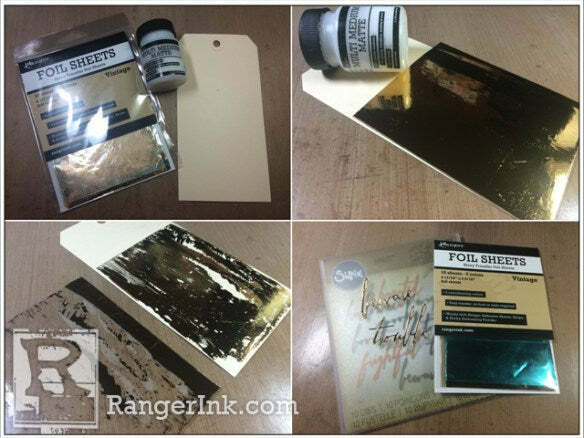 Use remnants of the foil sheets to create a rougher foil effect. 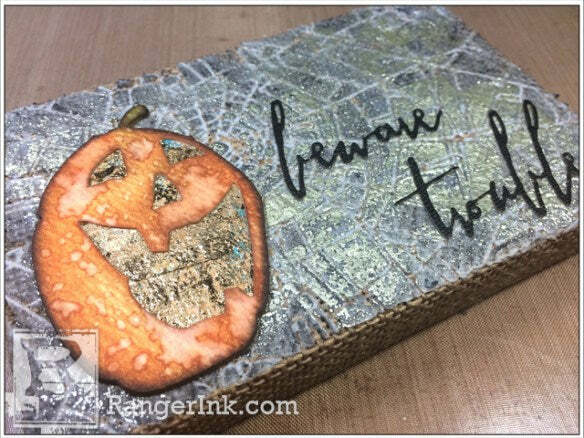 Apply Glossy Accents to the back of the top die cut and the top of the bottom die cut, (see picture), sandwich the foil between and glue together. 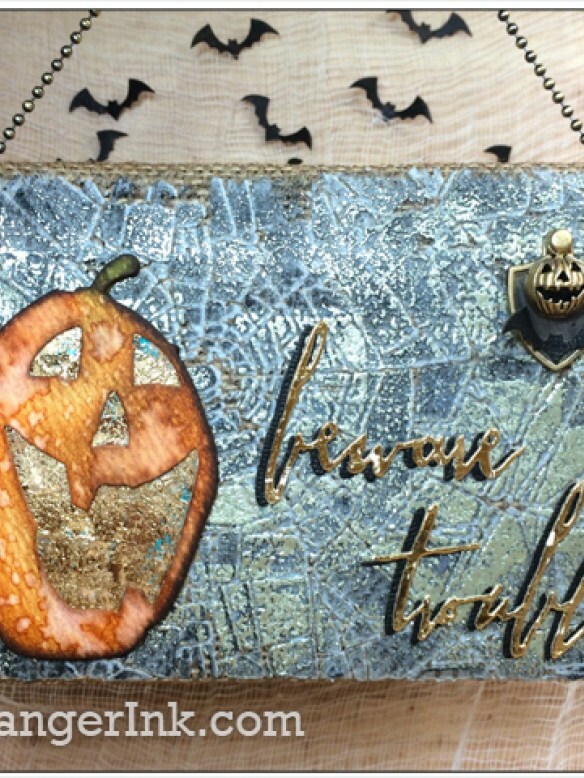 Step 4: Die cut words from the new Tim Holtz handwritten halloween thinlits dies from black cardstock and glue the words and jack-o-lantern onto the panel with Glossy Accents. Step 5: Cover a manila tag with Matte Multi Medium. Working quickly, cover the wet Multi Medium with a sheet of foil and burnish with your fingers. Leave to dry for a few minutes and then pull up the sheet. 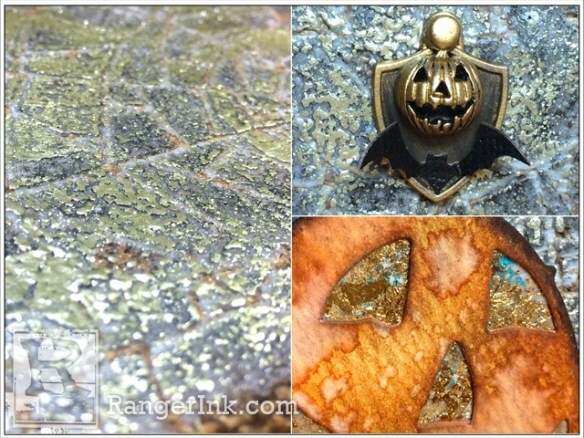 You get this very cool distressed foil effect. 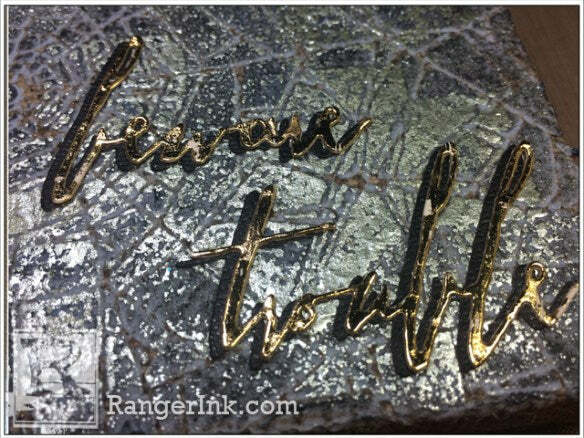 Die cut your chosen words from the foiled manila tag. Step 6: Apply Glossy Accents to the back of the die cut words. Step 7: Stick over the black die cut words, off setting slightly to give a shadow. Step 8: Alcohol Inks are the perfect way to bring your adornments into your chosen colour scheme. 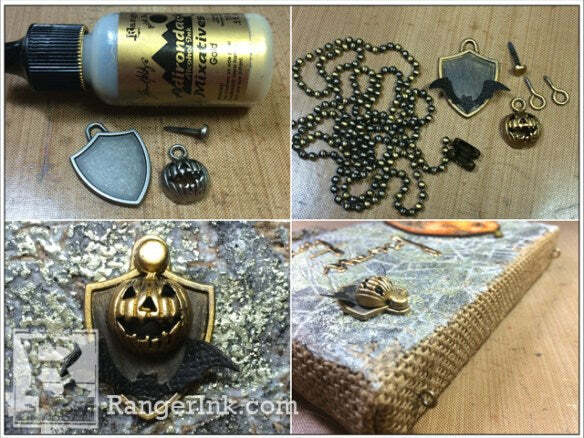 I covered idea-ology pieces with Gold Mixative Alcohol Ink, screwed the screw eyes into the top of the burlap panel and fed a ball chain through each end securing with a ball chain connector. Thanks for joining me. I hope you enjoyed this tutorial and will take time to make your own home decor pieces. Happy Halloween.